It has been said there are only 2 sureties in life: death and taxes. Well, we think we have found another one (at least it is a surety if you live in The Bahamas): rarely does anything go according to plan. This year we have learned to make plans with the understanding that those plans may change. Changes in our plans and schedules are common occurrences, whether it is a contractor who chooses not to show up as promised, a major water leak that takes priority on the to-do list, or a computer that crashes and takes with it all your son’s ungraded geography assignments. One might consider “people” interruptions as inconveniences, but we do not. Ministering to the needy and building relationships is why we are here. We consider it a privilege when we get the opportunity to listen to a hurting young person or to answer a question of one of our guests or to help a stranded traveler or to help a young man who was injured during a work site mishap. Relationships are at the core of what we feel God has called us to do. 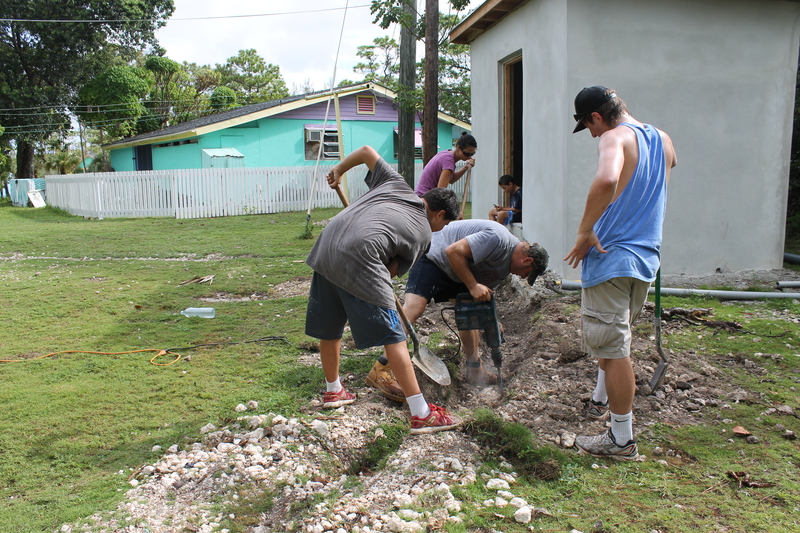 Please pray that God continues to give us the heart and passion for people and the relationships we are building and that we patiently and graciously accept the unsureties of daily life in The Bahamas. 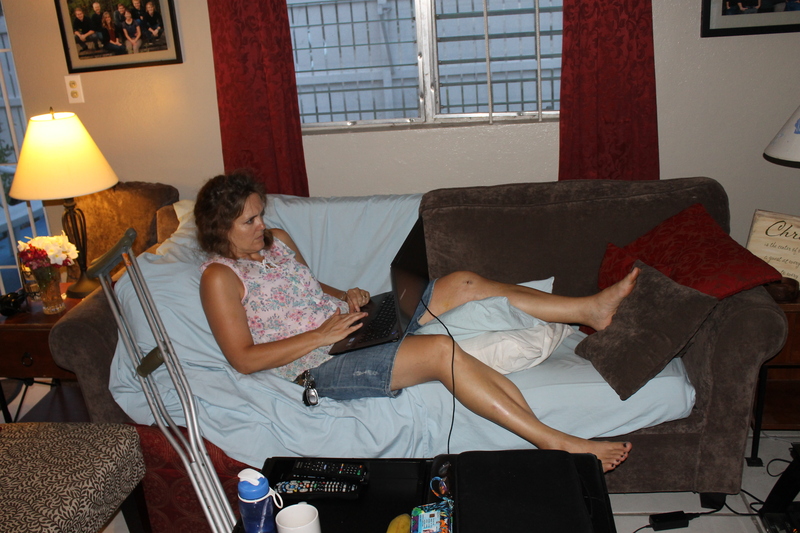 Mindy’s knee is healing nicely, and she is getting around better everyday. She saw the doctor a week ago and will be seeing him again in another week. The Adventure Learning Centre is 20 years old! We will be having a 20th anniversary celebration on September 20-21st. If you would like more information on this event, please contact us, and we can let you know how you can get involved! On October 11-12, 2013, we will be hosting a young adult weekend here at Camp. The weekend theme is In the Beginning: What Does it Matter? The guest speaker is Jay Seegert from Creation Education Center of Milwaukee, WI. We know Jay and are looking forward to having him here. Please pray that God fills this camp up with young adults and that we have a good opportunity to connect with these young people. Also please pray for the logistics of the weekend. 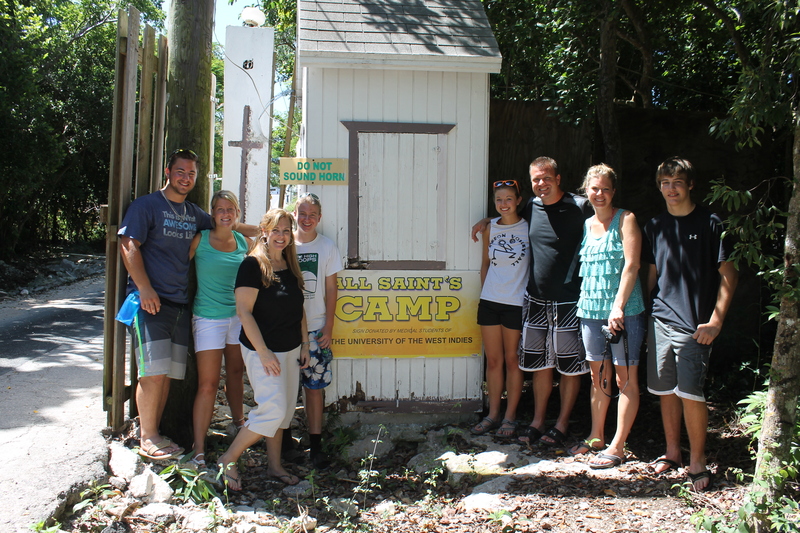 This is our first attempt at running a camp here in the Bahamas. We know God is in control and will send the right people to us. 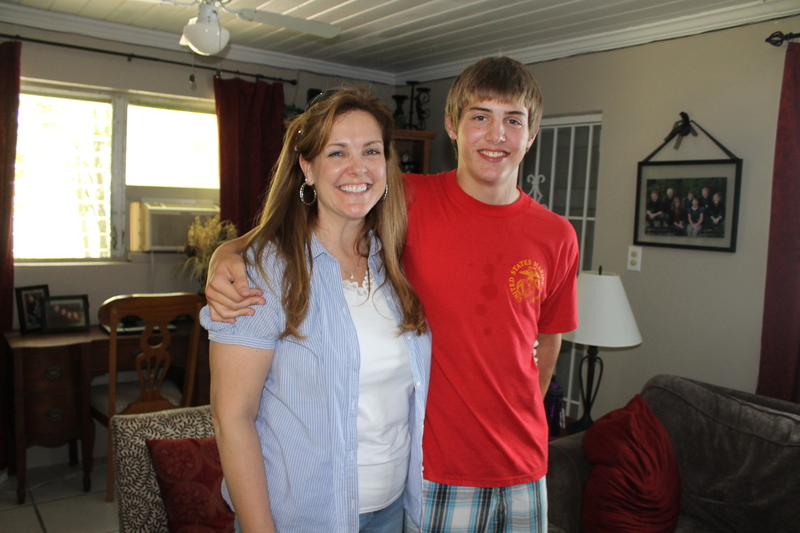 Missy and Liam McDaniel came for a visit the last week of July. If you think you are seeing Mindy here, that is an honest mistake. Missy and Mindy are twins. 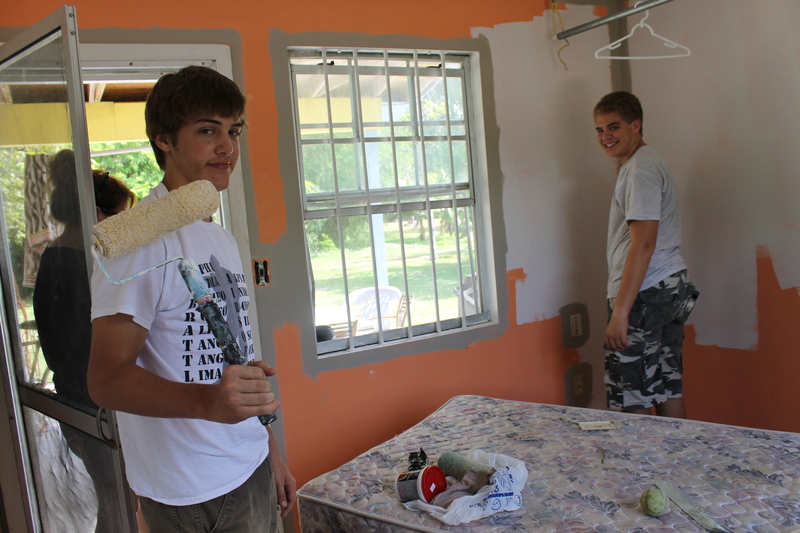 Liam and Zachary worked on projects; the first project was painting Tim’s new office space. After devotions at the Centre on Wednesday, July 31st, it was off to All Saints Camp to visit the residents and introduce Joel and Dawn Staus’s group and Missy and Liam to the ministry. 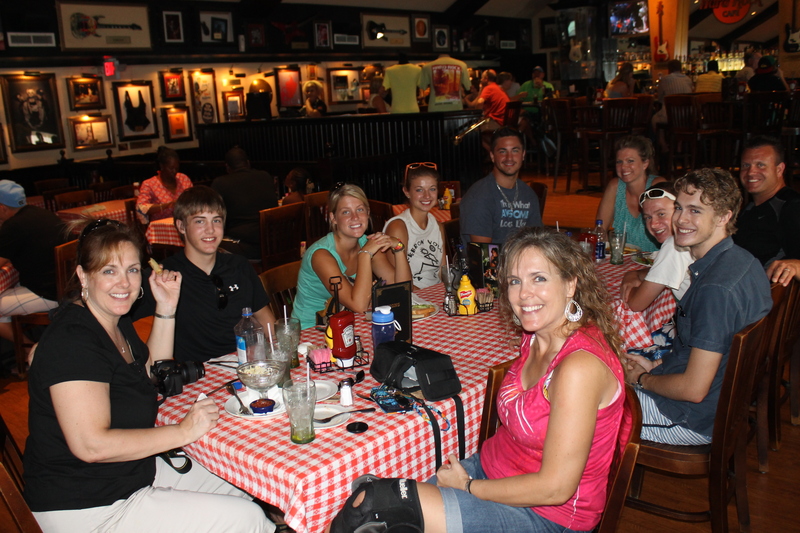 Then it was off to downtown to have lunch at the Hard Rock Cafe and to take the group souvenir shopping. And of course, no birthday can be without presents. 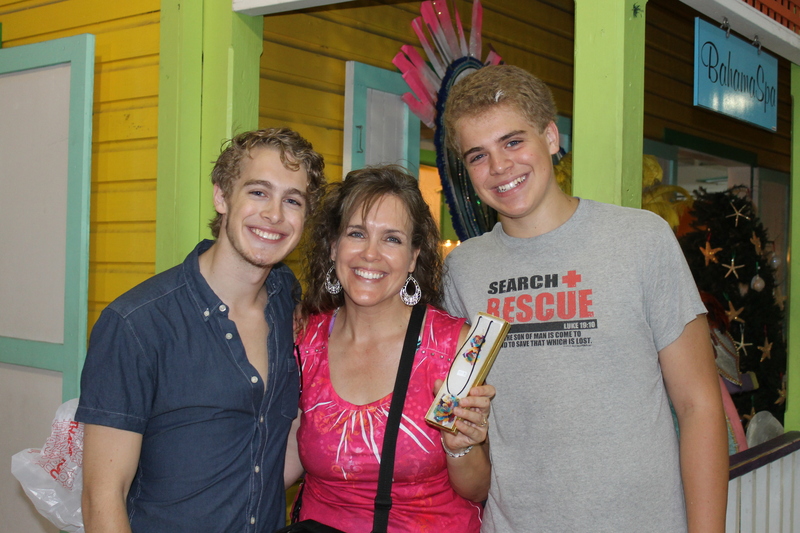 Zachary and Logan saw Mindy admiring this fish scale necklace and earring set and bought it for her. The boys are so thoughtful! What better way to cool off then a dip in the ocean. 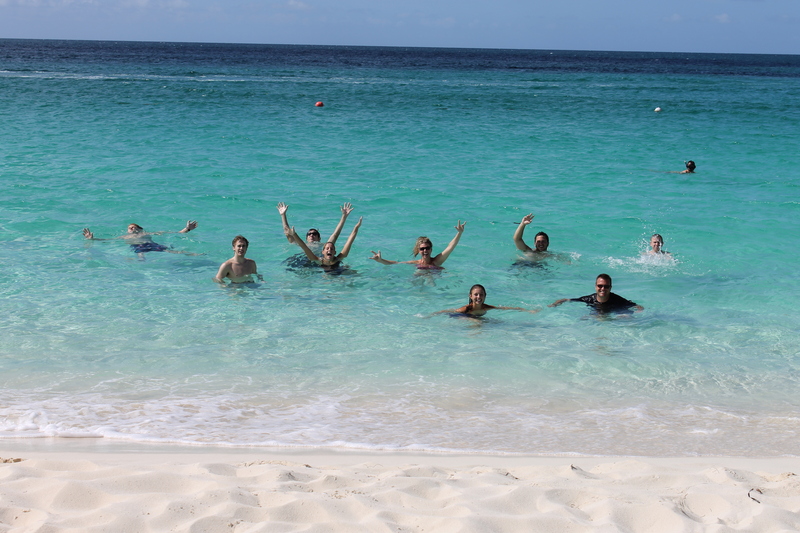 This was the group’s first time to Cabbage beach. Consensus: best beach on the island. After the beach, we drove the short distance back home (remember the island is only 7 miles x 21 miles and everything is “close”) to shower and pick-up Tim to go back up to Paradise Island for dinner at the Green Parrot and an evening at Atlantis/Marina Village. We spent our 26th anniversary at the hospital for Mindy’s knee surgery. 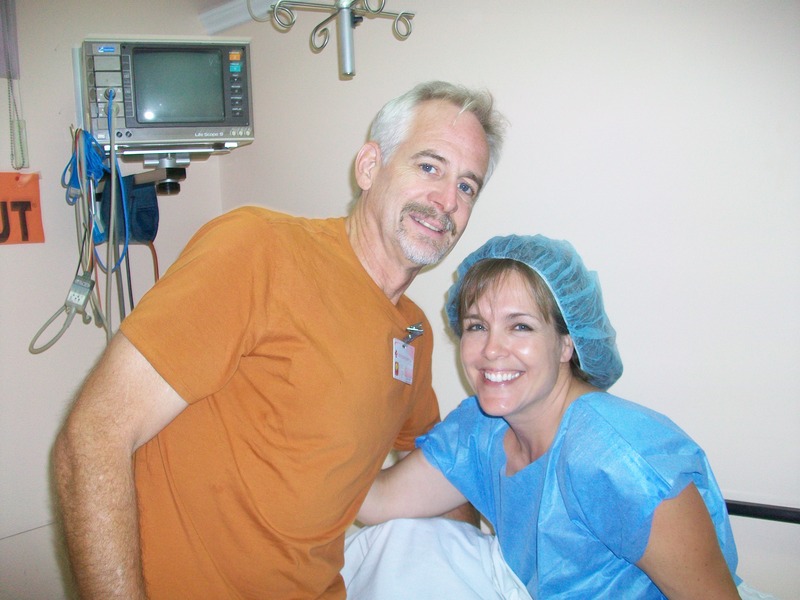 It was difficult to decide which day to have the surgery done on, but in the end we decided that our anniversary was the better day since Missy had planned her trip to the island to celebrate our birthday together. In hind sight, we see the week was planned perfectly. We praise God for His provision and how He worked everything out. Mindy does not remember this, but this is after she had come out of surgery. Missy (also an RN) was with us through the whole procedure. We are so thankful she was here to help. 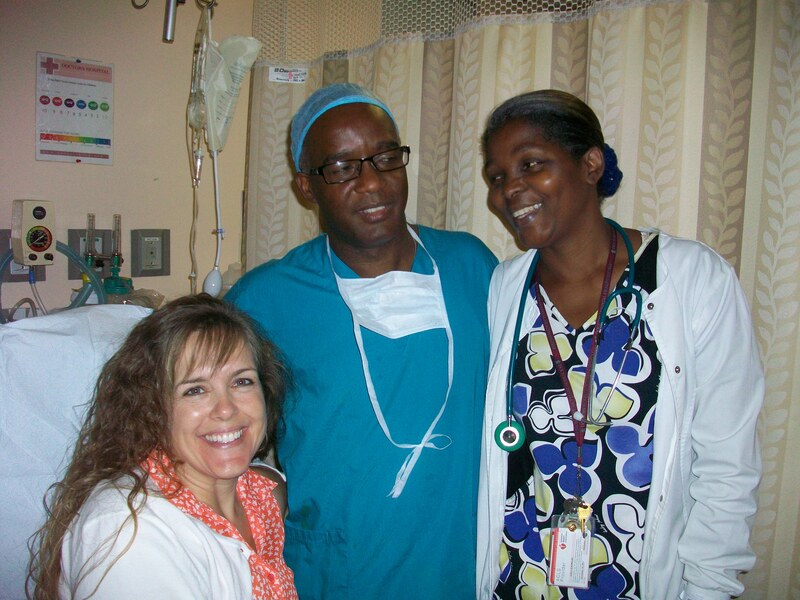 Dr. Nemo (anesthesiologist) and the nurse in the day surgery area of Doctor’s hospital. The anesthesiologist was great, he tried to balance Mindy’s desire to be medicated (loopy) as little as possible with the necessity of providing enough medication to provide comfort. Although he could not prevent the nausea and vomiting that plagued Mindy for the rest of the day, he did a great job at taking care of her. At home, after the surgery, Ms. Aida stopped in to see how Mindy’s surgery went. 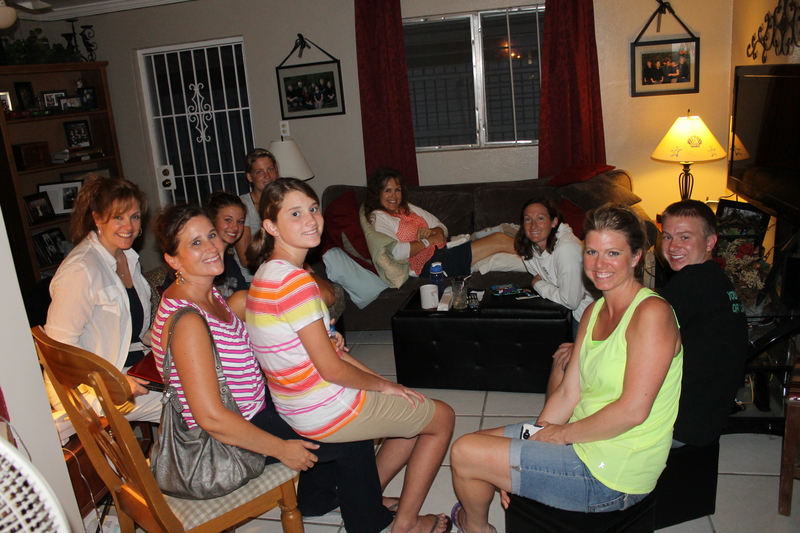 Mindy’s house full of visitors the evening after her surgery. Even though she was very nauseated from the anesthesia, she insisted on welcoming visitors. The day after Mindy’s surgery, Missy and Liam left to go home. Sad fact about that day, they had to be at the airport by 7am for their 8:50 flight, but the flight never took off until 4pm. They spent 8 hours at the Nassau airpot waiting to take off. Two days after surgery, the bandage came off. Mindy spent the weekend on the couch getting work done on the laptop. 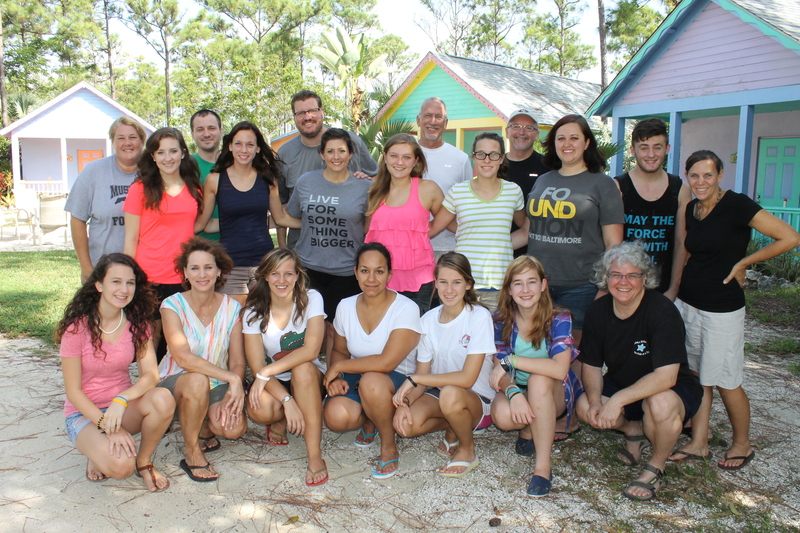 On the day of Mindy’s surgery, other ALC staff stepped in to welcome the Eikon group from Calvary Chapel, Ft Lauderdale, FL to Camp. 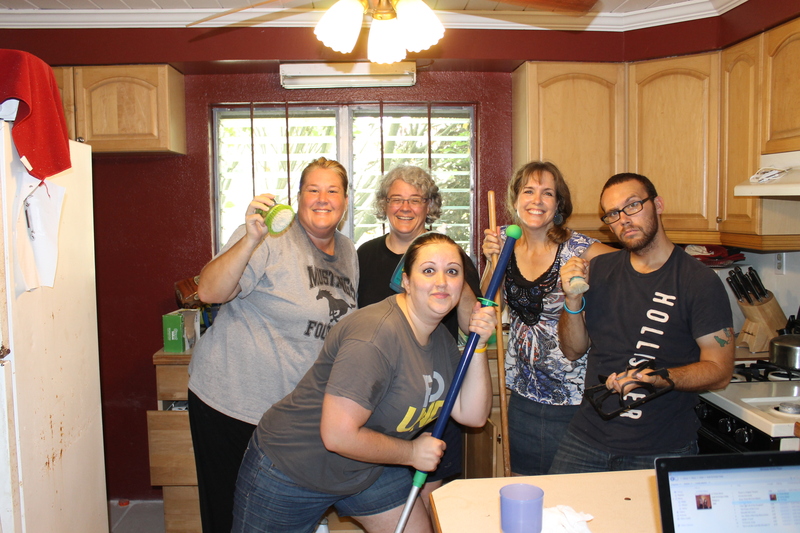 Tim was blessed with help from others in serving this group over the weekend. They arrived on August 1 and left the morning of Monday, August 5th. A furry critter someone found on site. 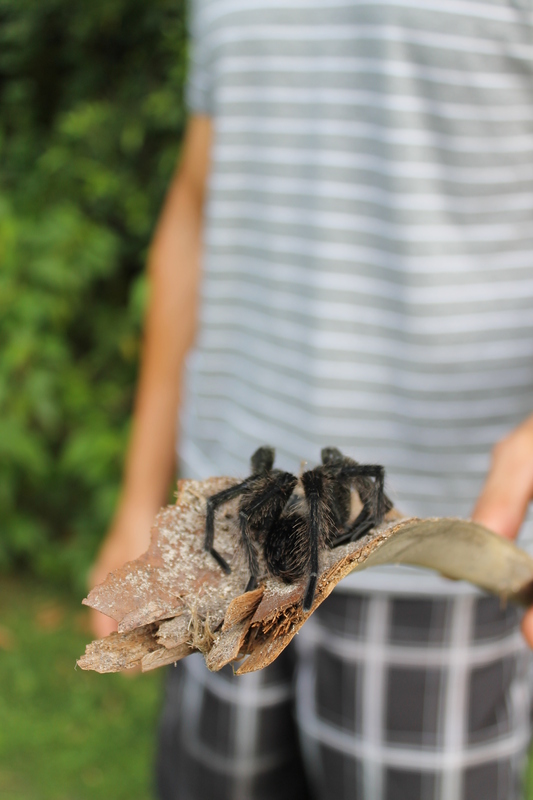 We have always been told there are tarantulas on the island, but this is the first one we have seen, and it was dead. 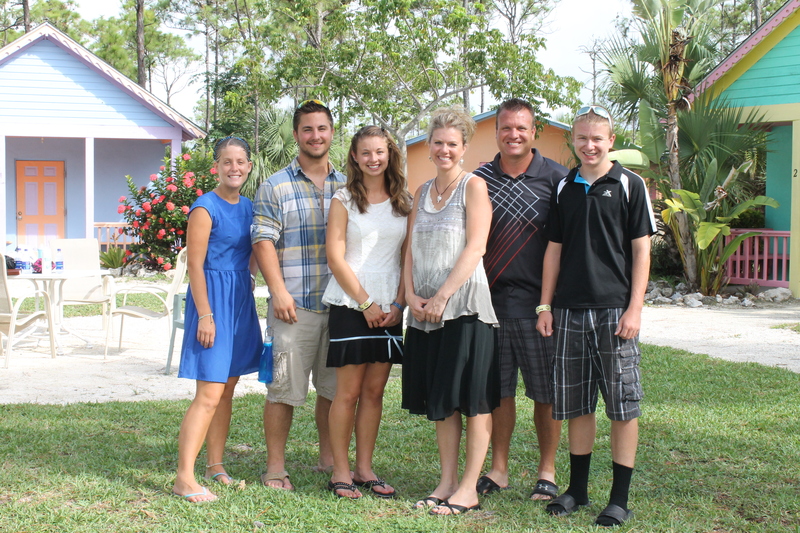 Finally, a family picture of our pastor’s family. 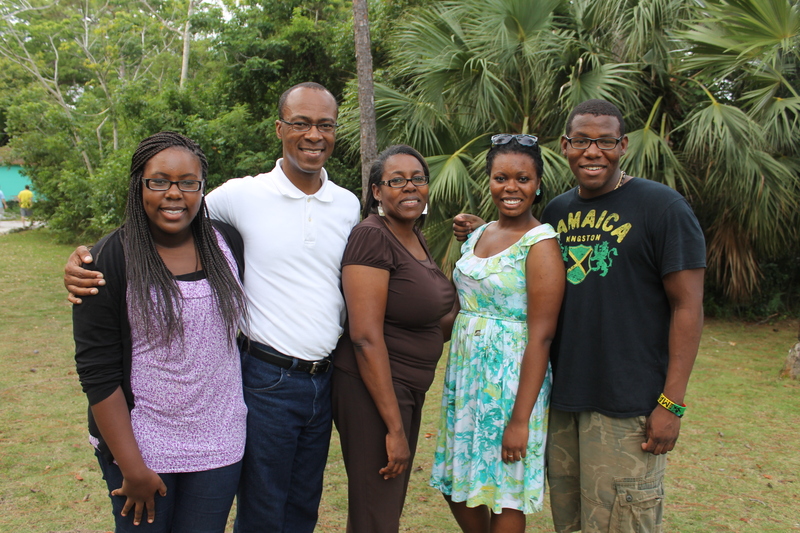 This is Cedric and Alexine Moss and their children. Cedric is pastor of Kingdom Life Church. These people are such a blessing to us, and we are so thankful God has allowed our paths to cross. This was taken at camp on Sunday, August 4th when we welcomed to camp a mission team from Florida that would be working at Kingdom Life Church the next week. 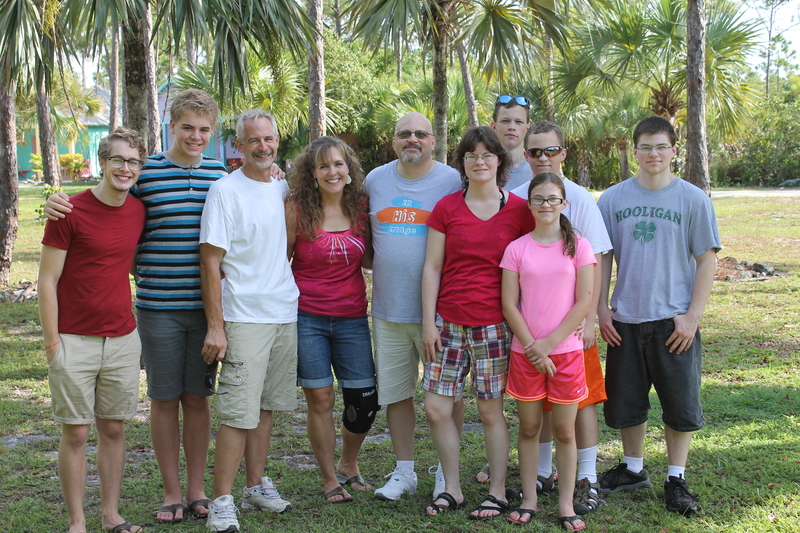 This is the group from Metro Life Church in Orlando, Florida. 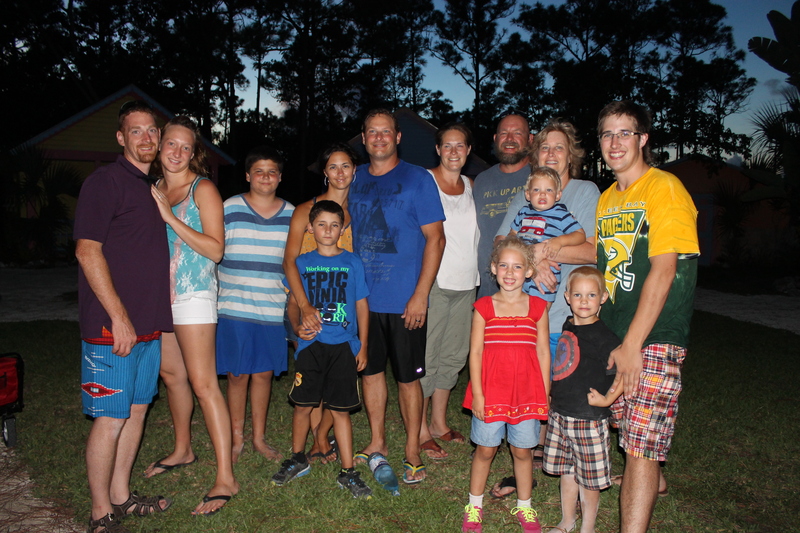 They arrived at camp on Sunday, August 4th to work at Kingdom Life Church’s Music Camp for the week. 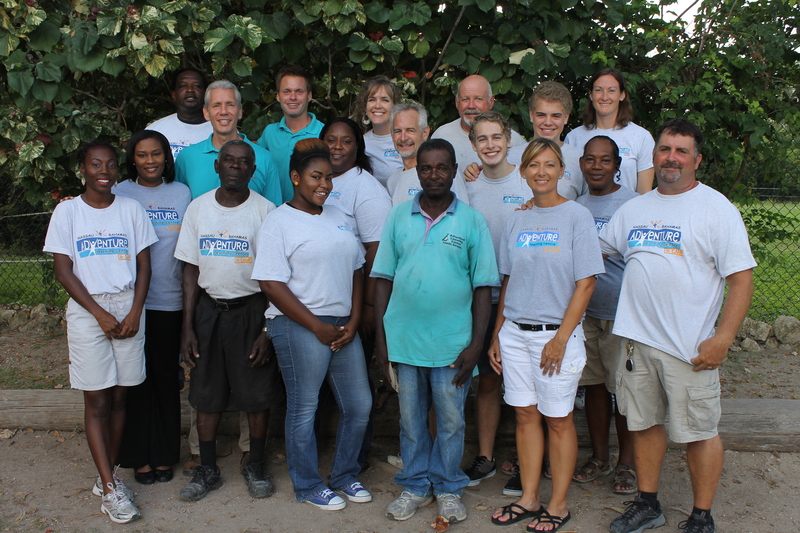 These people had such servant hearts and were a joy to get to know. 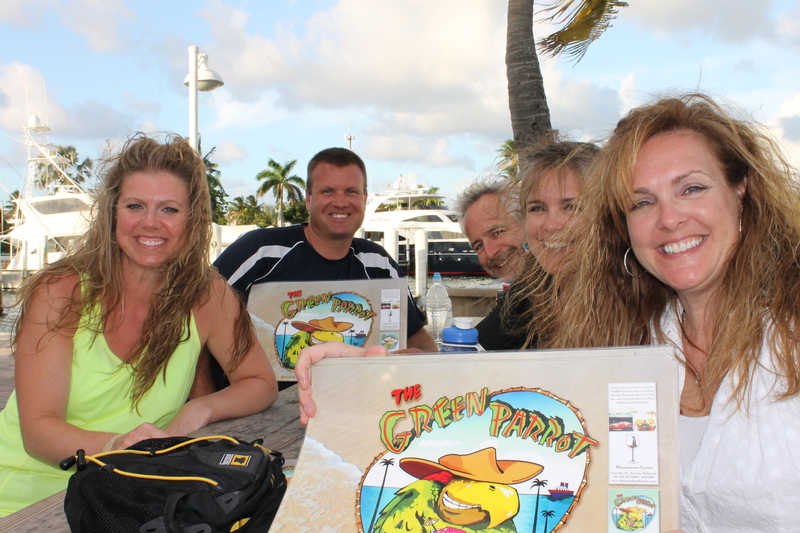 On Monday morning, friends from Wisconsin, Dave and Melissa Mischel and their family, came to Nassau for half a day while on a cruise. They took a taxi from the port to the camp to see us and the ALC ministry. 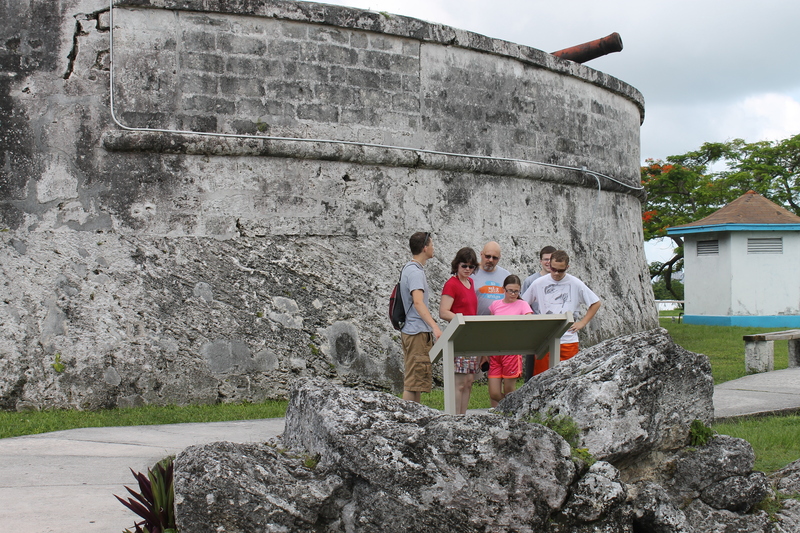 While Tim took the Eikon group to the airport, Mindy drove the Mischels up to see Fort Fincastle and the Queen’s Staircase before taking them to the port to board their ship. On Monday afternoon, it was time to say good-bye to Joel, Dawn, Carissa and Austin Stauss and Julia Williams and James Quick. 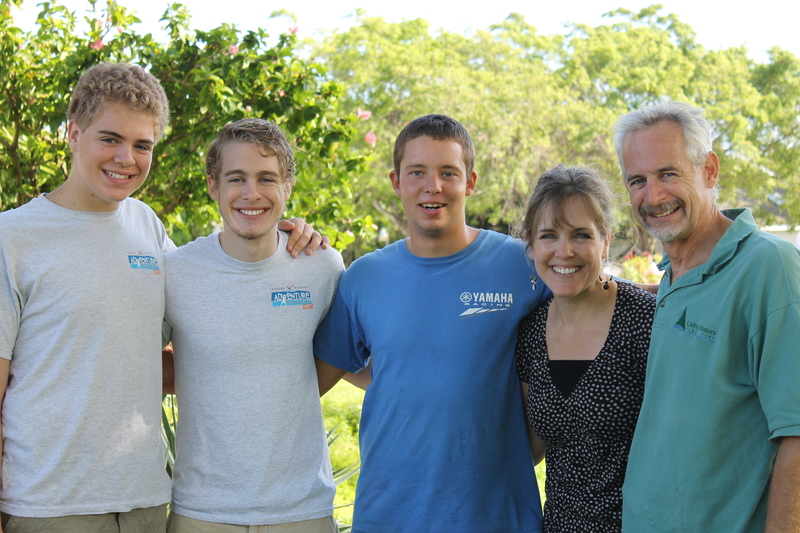 We had enjoyed getting to know and serve this family. They spent most of their time at the Centre working with the Day Camp. We are looking forward to having them back some day. On Wednesday the 7th, it was time to say good-bye to Katie Morris. 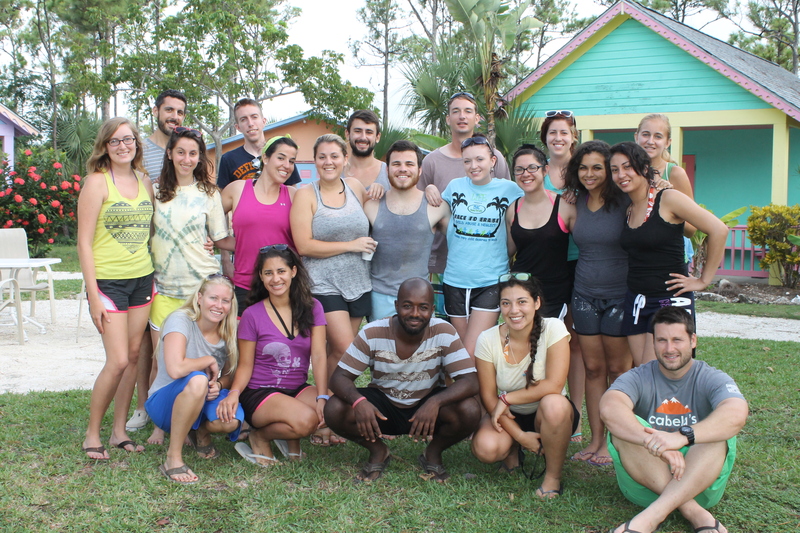 She was on the island to serve as facilitator and Day Camp staff at the Centre for the last 7 months. 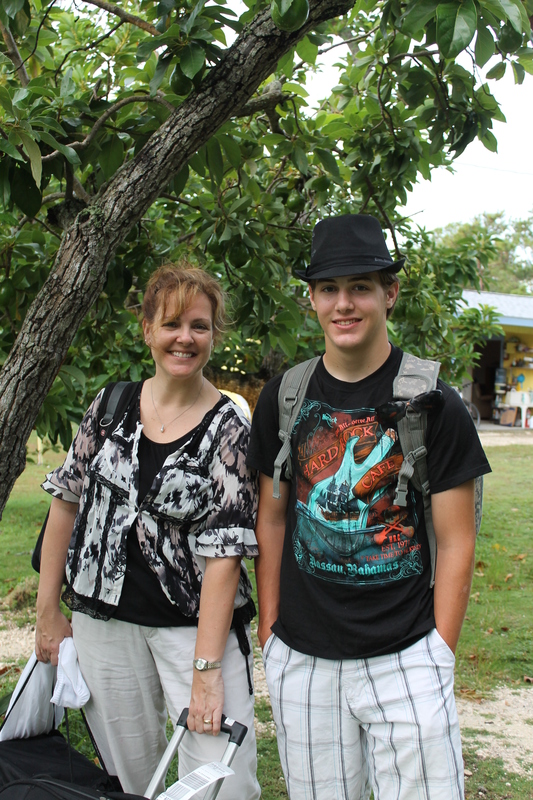 Later that same day, we said good-bye to Steven, another summer volunteer at the Centre. 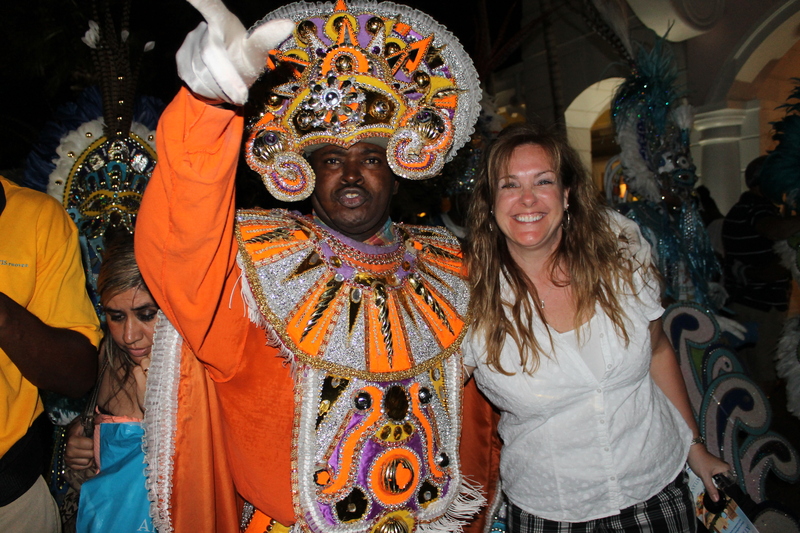 On Thursday, we picked Curtis and Rachel Niemeyer up at the Colonial Hilton in downtown Nassau. They arrived to the island a week ahead of the rest of their team (the rest arrived on Saturday). 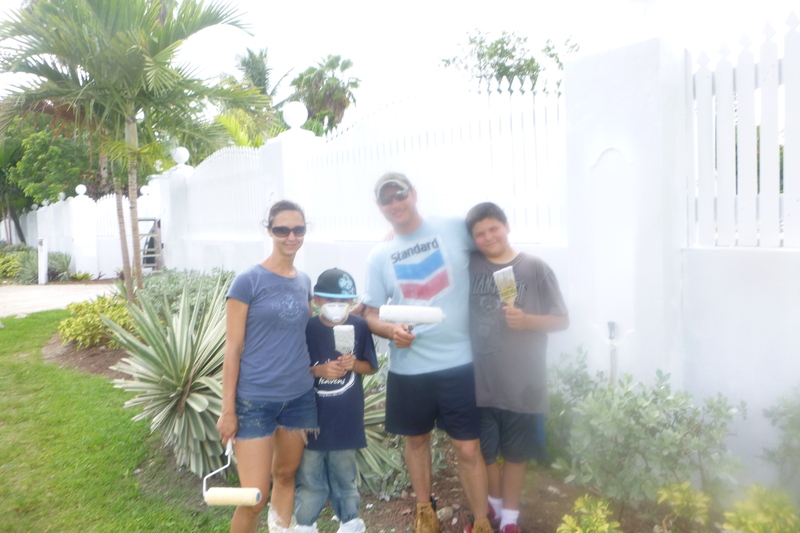 Curtis and Rachel and the two boys helped Tom paint the front fence at the Centre on Friday. The Niemeyers are from Westby, WI. 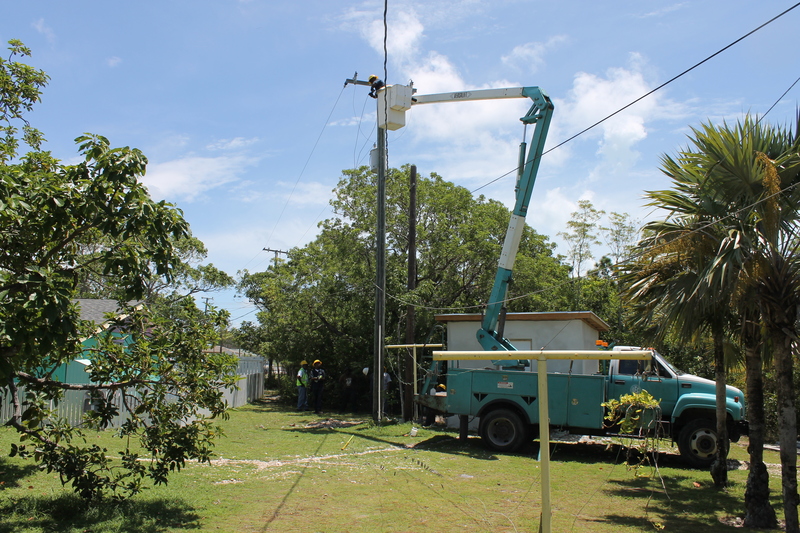 Bahamas Electric (BEC) finally came (be it 3 weeks later than promised) to hang new power lines for our electric upgrade at camp. They shut down the power for 3 hours, not just to our site but to the whole section of this side of the island. We were joking that we hoped our neighbors would not hold it against us. BEC left that day with a promise to come back in a few days to hang the transformers. 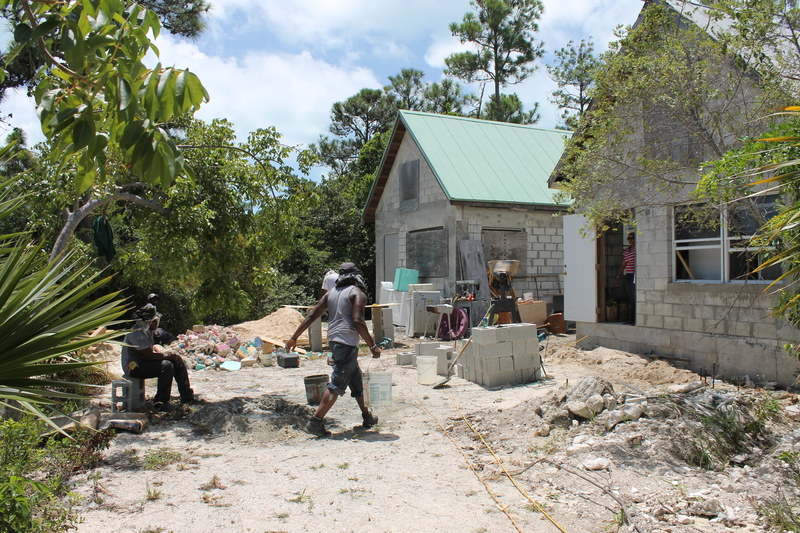 Scott Hamilton is the contractor who built our electric meter house and is now working on finishing the staff cottages. 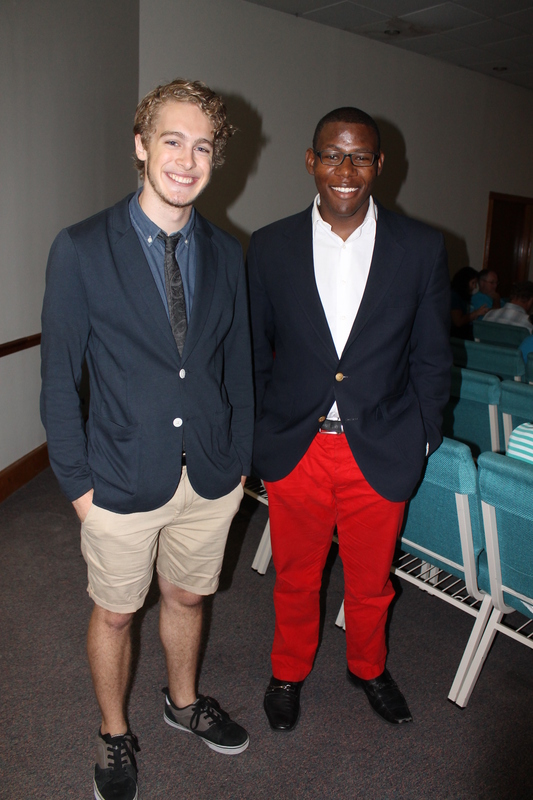 This is our pastor’s son, Cedric Jr. We took this picture because he and Logan have pretty much the same taste in clothes. 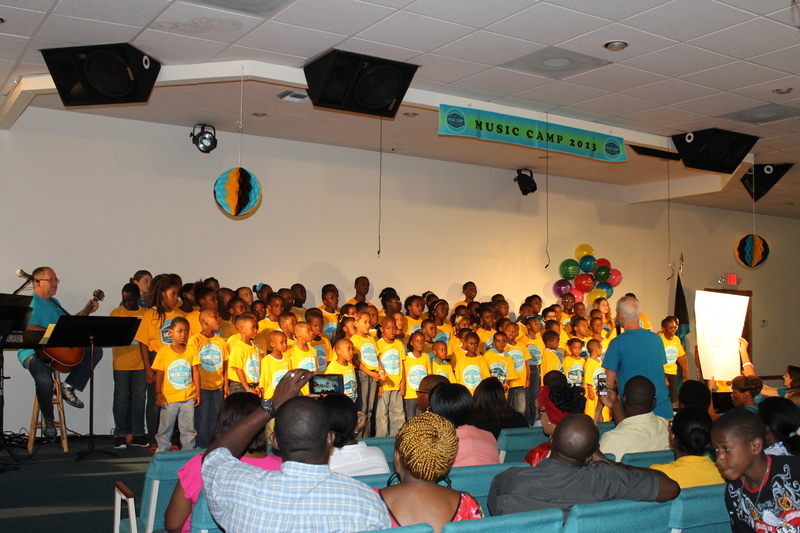 On Friday evening, after a week of Music Camp, the campers at Kingdom Life’s Music Camp put on a performance for us. On Saturday morning, these 3 ladies from the Metro Life group came to our house to “bless us” by helping us clean our cupboards. Thank you, Betsy, Wendy and Kami for your servant spirits! Tim and Curtis Niemeyer trying to slope the drain line down to see if the “upwards angle” was causing water problems in our bathroom. Another good-bye! 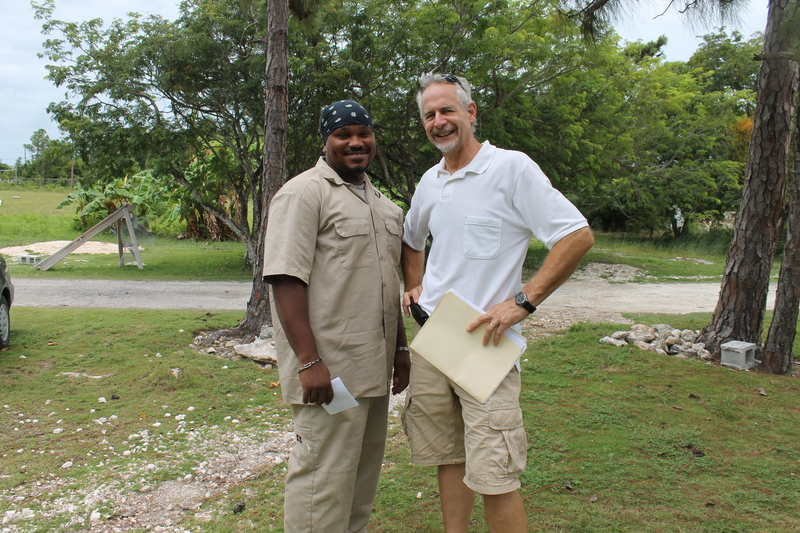 Michael Chatigny had arrived on the island one day before we did in January. He had become like another son to us. On Saturday, we took him to the airport to fly back to his home in Ft. Lauderdale, FL. 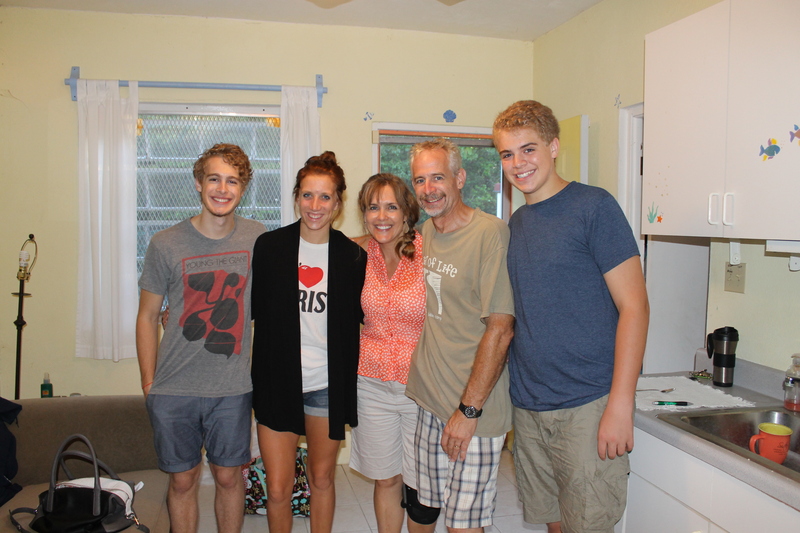 We picked up Dani and Zeke Miller’s team (with the exception of the family in the middle-Curtis, Rachel Niemeyer and sons-who came a week earlier and left this past Wednesday), from the airport on Saturday, August 10th, and they will be leaving on August 26th. 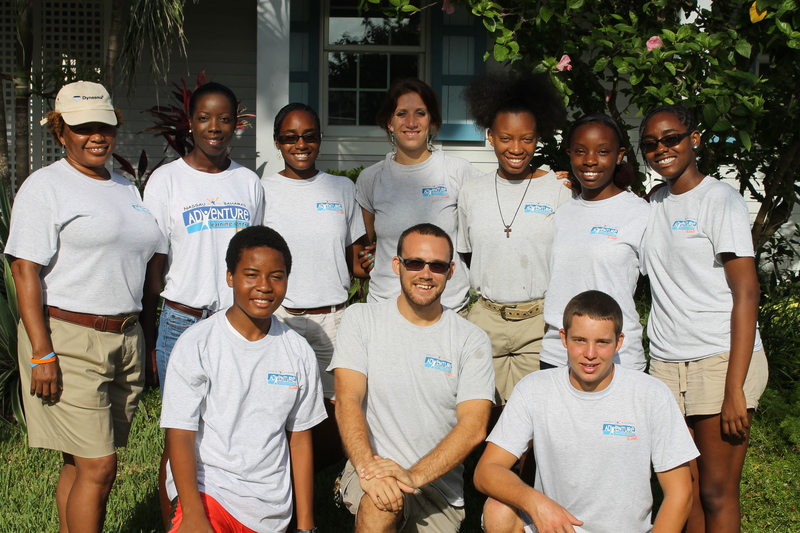 They are here to help at the Centre and Camp and at ALL Saints Camp. On Sunday, we said good-bye to the Metro Life group. They were a joy to serve. One thing nice about having a musical group at the camp, we were treated to a lot of GREAT music all week. On Monday, Dani and Zeke’s team started work projects for the ALC Monday morning. Some started digging a little to finish getting electrical boxes into the ground. Yes, the team was slated to work on projects for the ALC, but… change of plans! A water leak had to be found! Since we moved into the house in February, we have been having issues with water coming in to the bathroom. 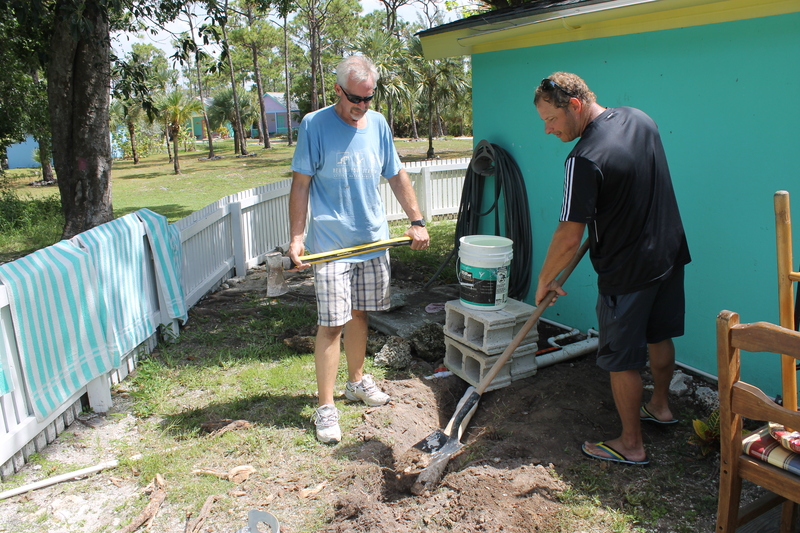 We thought it was the septic tank behind the house was over flowing into the ground and then coming in through the brick walls or floor. We also thought maybe there was a disconnected pipe underground somewhere. We just didn’t know. All we knew was the water was starting to “pour” in. 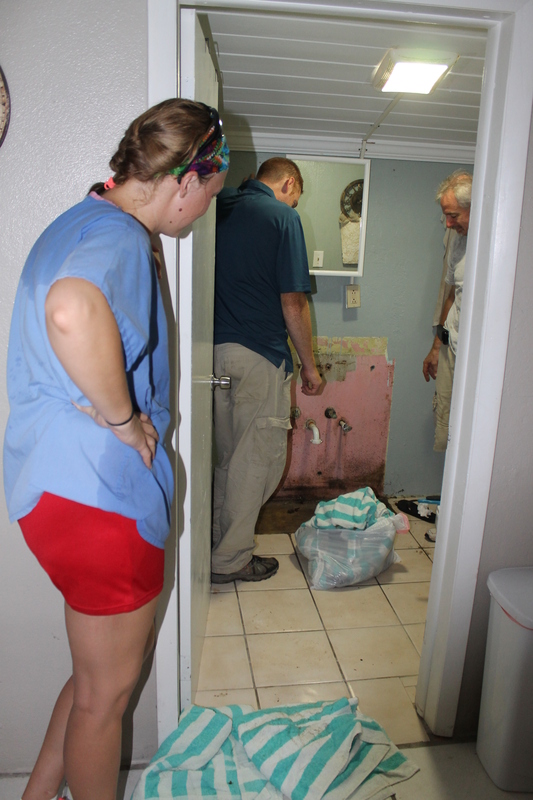 Since one of the guys in Dani’s group was a plumber, we decided to use him and his wife to help us solve the water problem once and for all. Problem found! 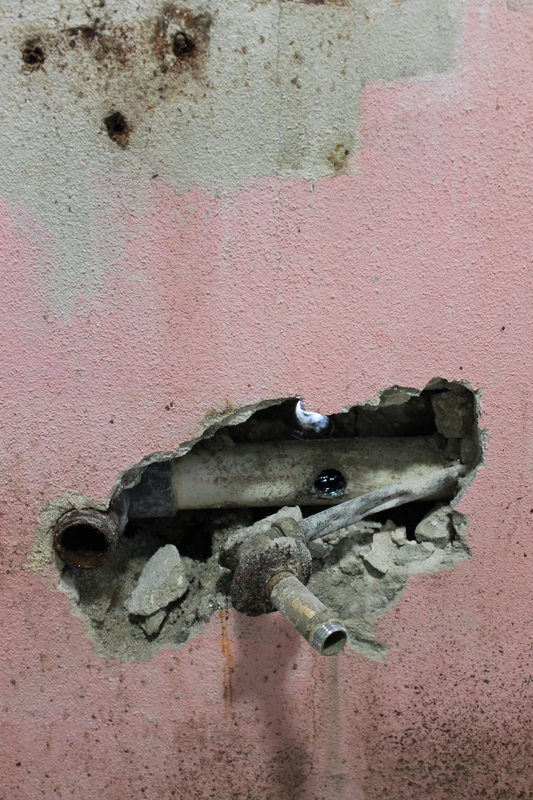 After pulling the sink off the wall and busting a hole in the concrete, we found the water line had been drilled right through the drain line. 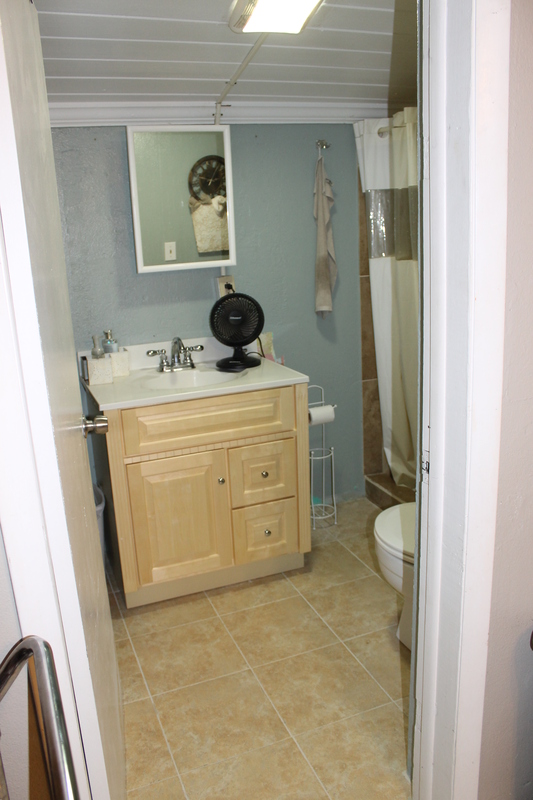 After 2 days of diligent work from Jack and Raenell and Tim, the old tile was removed (the old tile did not cover the cement floor under the old odd-sized, rotted vanity), new tile was laid, and a new vanity and plumbing work was installed. We now have a fully functioning, DRY bathroom. No more smell! Yeah! 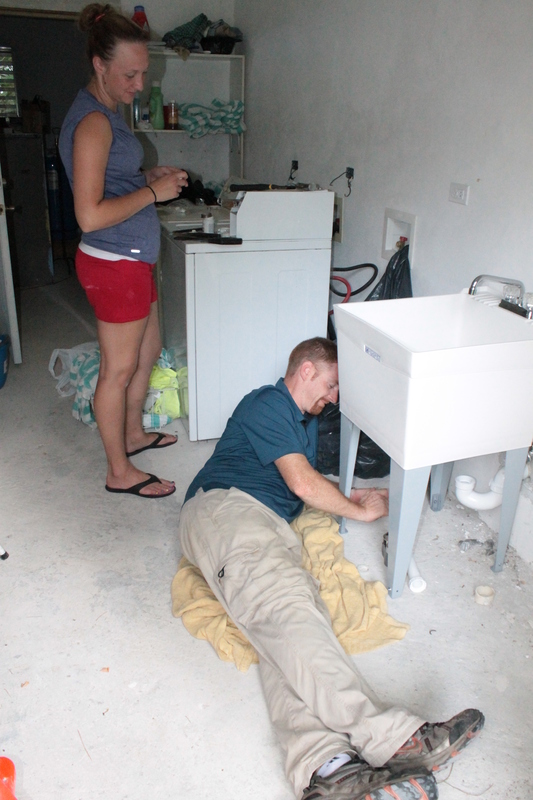 Plumber Jack also installed a laundry sink in the bath house laundry room! 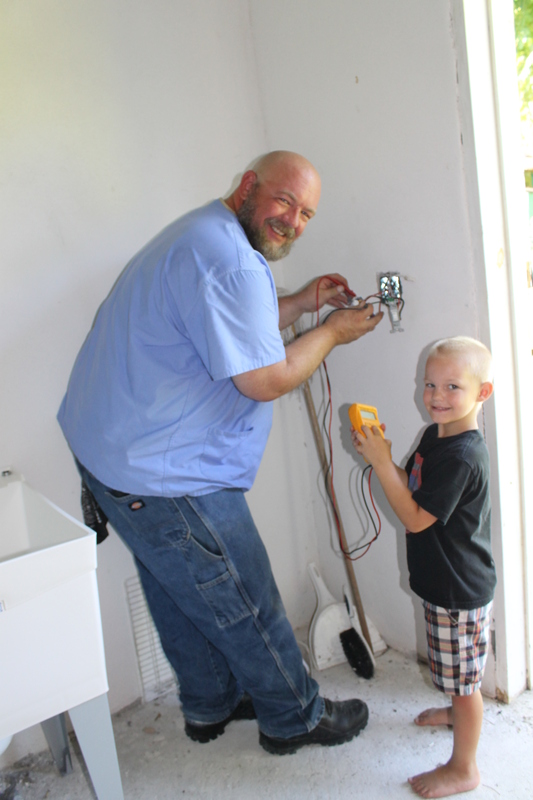 Zeke with his assistant Micah, mapping and labeling wiring in the bath house laundry room and finishing electric fixtures in the bath house so we can get our certificate of occupancy. 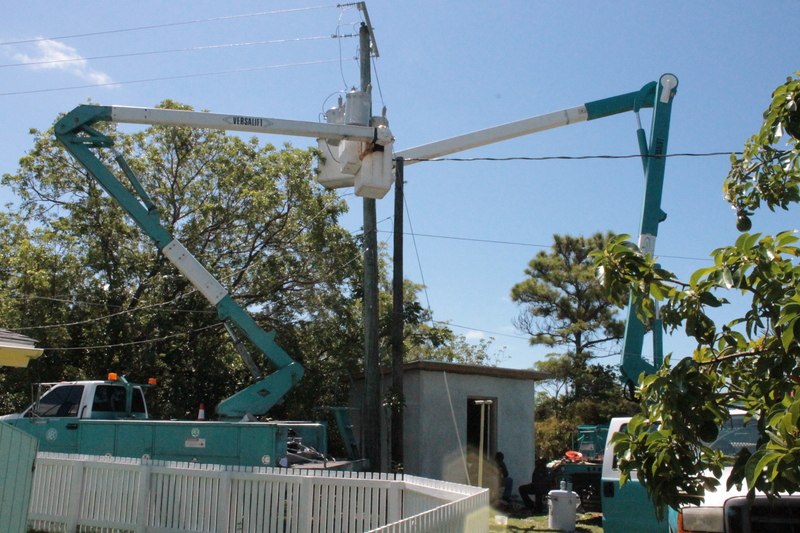 BEC was back this week to hang the electric transformers. One step closer to a full electric upgrade. 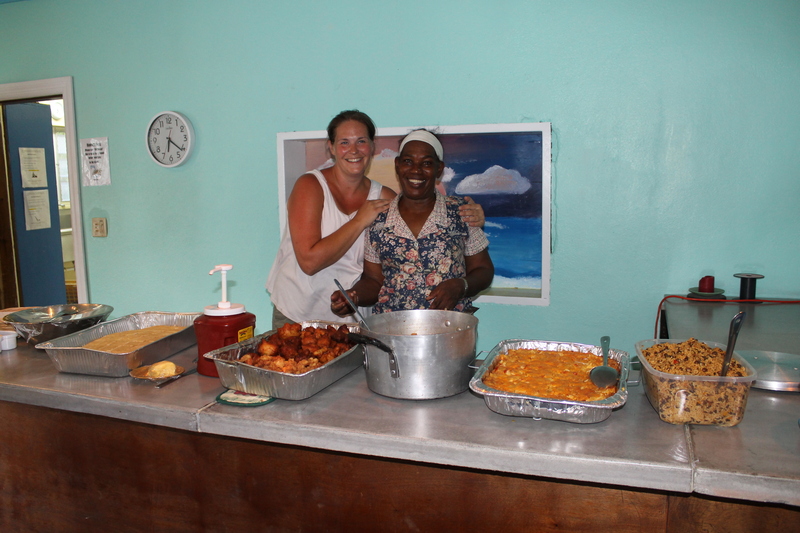 Dani and Ms. Aida made ALC staff an everything conch meal one evening. Yummy! 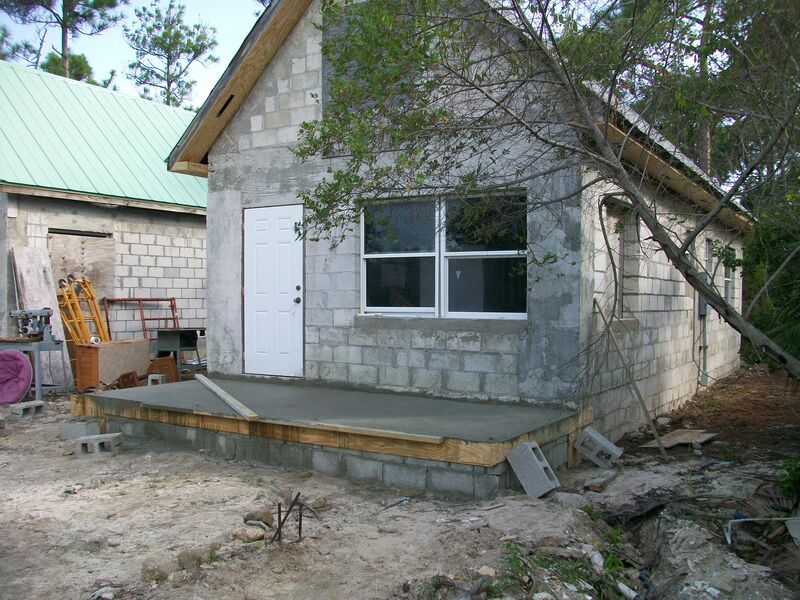 This week Scott started work on the staff cottage. This is Janeel with Jen. 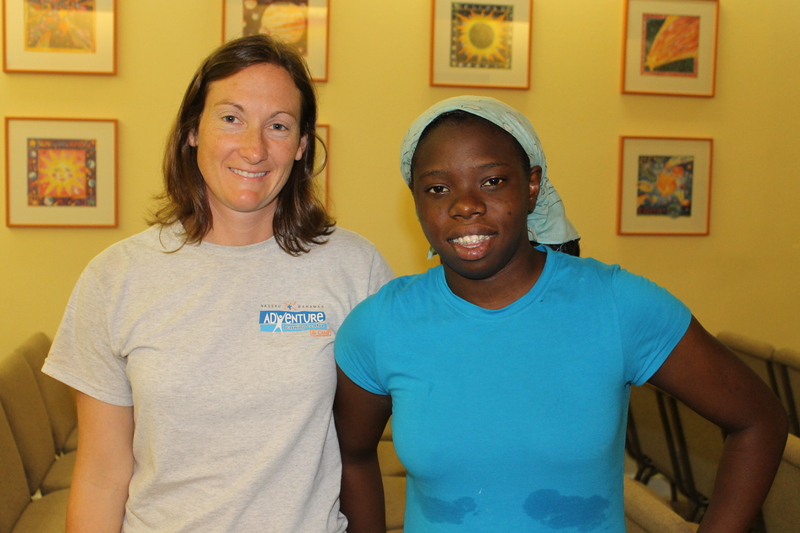 Janeel is a young lady from the community, and she came to help out this week at the Centre. She worked really hard, and her presence was a blessing. 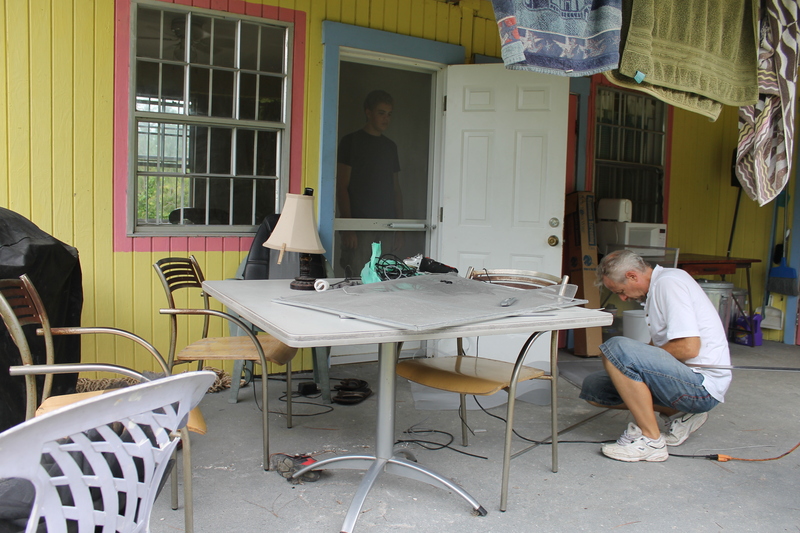 Tim and Zachary are nearly finished with the camp office. Tim will soon have a place to spread out and do camp business. 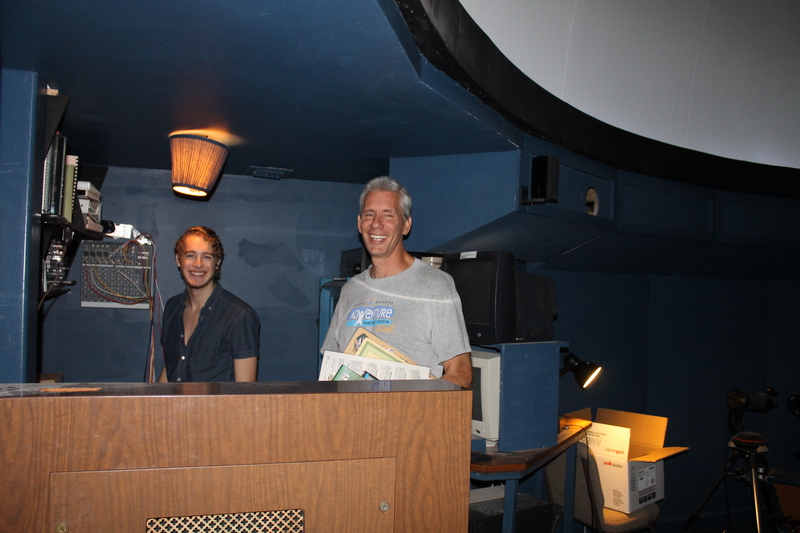 Logan has been working on the planetarium shows and computer related work for Mark on Mondays, Wednesdays and Friday mornings. This is in the planetarium at the Centre. 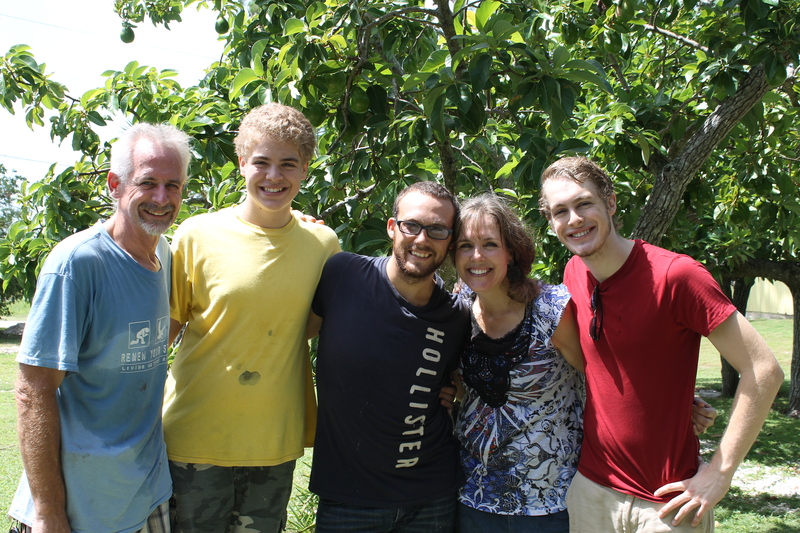 Pray for the coming school year: Logan is taking classes through Liberty University Online as a dual enrollment student; Zachary will be homeschooled by us again, but plans have not been fully made yet. Please pray Mindy finds some time to get this important task done. 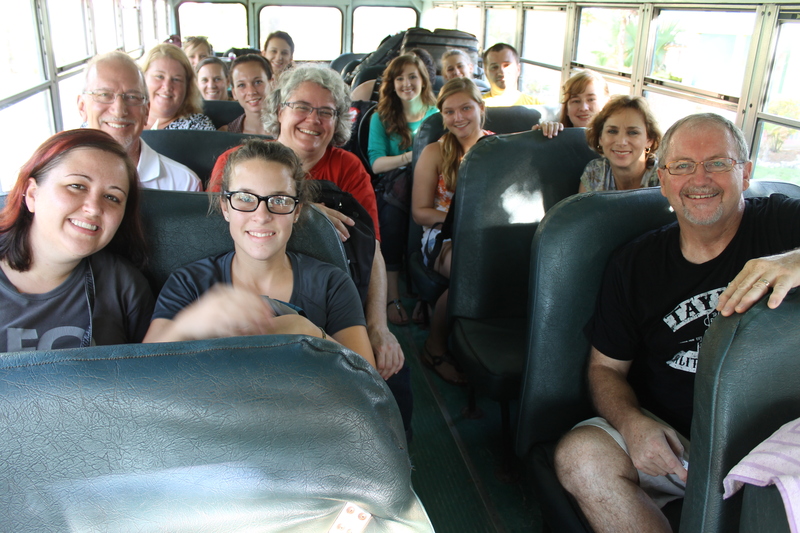 Pray for God’s provision for education expenses this fall. They are high because of Logan’s online course work through Liberty. Praise the Lord Garrett has a job in Minneapolis now, but please pray that he finds someone to take over his apartment lease in La Crosse. Someone had told Garrett he would take over his lease, but now that young man has not shown up. Thanks for checking in and getting updated on what is happening in our lives and ministry work. We hope you will take some time to contact us and to let us know how you are doing. God bless you all and have a great weekend! 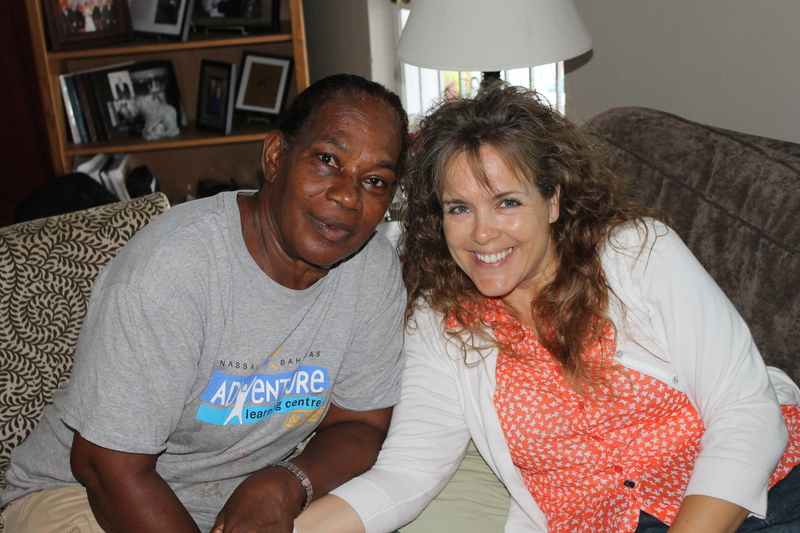 When the caregiver becomes the care receiver! 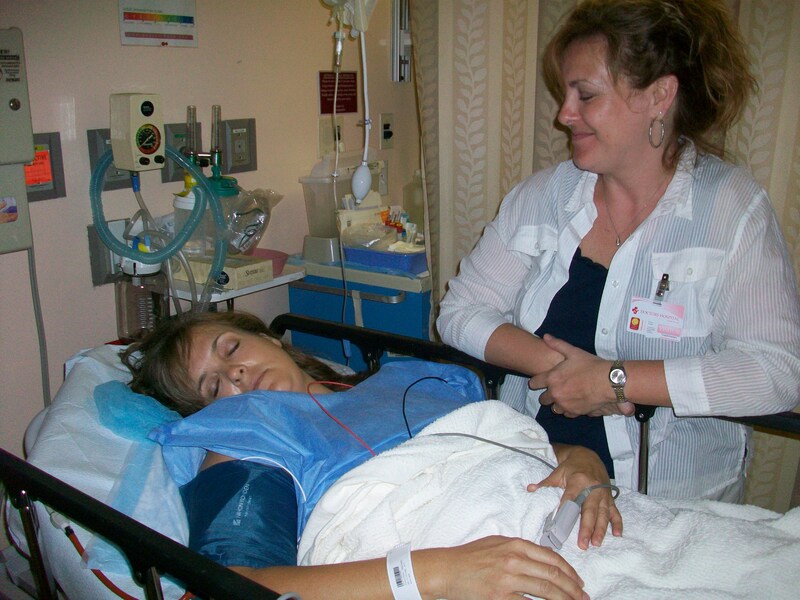 August 2, 2013 12:09 pm / 5 Comments on When the caregiver becomes the care receiver! As a nurse, I admit that I am not a good patient. Of course there is the “too much knowledge” issue, but more importantly there is a sin issue here. The fact that I hate being a bother or burden to others or that I hate the loss of control that comes with putting myself in the care of others, shows I struggle with pride. I am learning that I need to be humble, graciously accept help from others, and give up the need to control my life and circumstances. I am learning that my sufficiency is not in myself but in God Himself and those He sends into my life to assist and guide me. With that said, I can now happily report that surgery is done! The doctor found a clean-cut, flap tear of the cartilage in my left knee. All indications are it was successfully treated. The scope also revealed the ACL (anterior cruciate ligament) is intact. 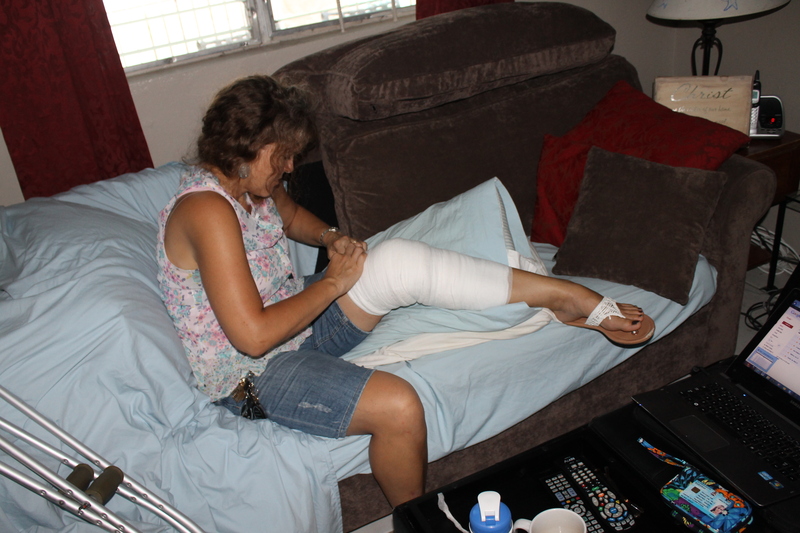 I am able to bear weight on my left leg but will use crutches for a few days for walking stability and comfort. It was a pretty rough evening yesterday with post-anesthesia related nausea and vomiting, but by 3:00 am this morning, I was able to keep down some water and saltines. I woke up this morning with deep, aching pain in my knee, but no nausea. The nausea did return, however, when I was up and about too much and after taking a couple of Tylenol with codeine pills. I have decided that shorter trips out of bed and non-narcotic medication is in the plan for me the rest of the day. Tim and I are so glad my sister Missy was with us yesterday during the whole Doctor’s Hospital routine. As a nurse, she was a huge help. After yesterday’s experience, I have reached the conclusion that I will never allow myself or someone I know be at the hospital for surgery without someone at their bedside during the recovery time. All I am going to say is, the doctors (surgeon and anesthesia doctor) were phenomenal, but the nursing care was not that great. I am sure a lot of my critique is based on my own nursing training (and that of my sister’s), but there were a lot of things that we consider “no, no’s” in nursing care. I see the doctor next Thursday for a follow-up appointment and will know more information after that. I will be cooperating with doctor’s orders to lie low for a few days, so could you please pray for Tim as he works with the groups here at camp without me? Have a great weekend, and THANK YOU so much for your prayers and concern!